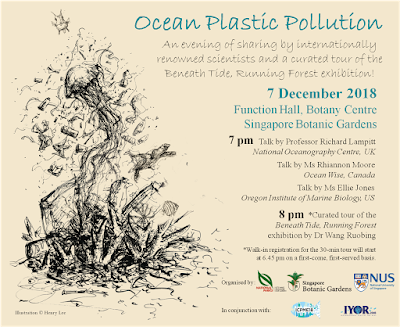 FREE Talks and Tour on Ocean Plastic Pollution! Walk-in registration! First-come, first-served for tour! Three eminent international scientists are here as part of the International Conference on Plastics in the Marine Environment, organised by NUS, SCELSE, Cefas, and NParks! A specially curated tour of the Beneath Tide, Running Forest art-science exhibition by Dr Wang Ruobing.